The world champion has taken the yellow jersey after the second stage. 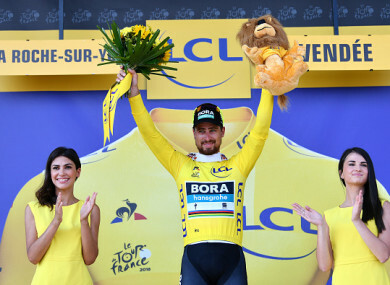 WORLD CHAMPION PETER Sagan said he had three reasons to be cheerful as he won stage two and took the overall leader’s yellow jersey in front of family and friends from Slovakia on the Tour de France on Sunday. Sagan edged Sonny Colbrelli in a reduced sprint finish at La Roche-sur-Yon after a late crash in the peloton. Overnight leader Fernando Gaviria came down in a mass high speed crash just 1.3km from the line, which Sagan and around 15 other riders avoided to set up a frantic finish. Sagan leads Gaviria by six seconds in the overall standings, with champion Chris Froome trailing by 1min7sec. Froome avoided a repeat of his first stage tumble, the Team Sky leader staying out of trouble as he goes in pursuit of a record-equalling fifth Tour triumph. But another Briton Adam Yates was delayed by a fall and two of his Mitchelton Scott teammates were both also involved in separate falls. Sagan, riding for Bora-Hansgrohe, edged a field of nine lined up for the final reckoning but had to deal with French specialist Arnaud Demare and the Italian Colbrelli, who came within a hair’s breadth of the win with a daring last second wheel push to come second. Sagan said: “It was something special with my father here and friends from my hometown. “It’s a great start for the fans,” he added. “Fernando won yesterday and now I’m the one with the yellow jersey,” it’s been exciting. “I could see it was going to be a good year,” said Sagan, who was thrown off the Tour last year after being judged culpable of a fall that ended fellow sprinter Mark Cavendish’s Tour. “This makes up for last year,” he said, adding he hadn’t seen today’s crash. “My team got me into the mix,” he said. “It was a mess over those last five kilometres all up and down and then going up the hill there was a headwind,” he said. The Slovak led the pack in the intermediate sprint behind solo escapee French veteran Sylvain Chavanel, and is now also top of the green jersey standings. Overnight leader Colombia’s Gaviria, who is just 23, said he was happy to be in the white best young riders jersey. “We’re happy, we had the yellow and that’s part of history. Tomorrow’s another day,” he said, with his Quick Step team amongst the favourites to win in Monday. Germany’s Andre Greipel was fourth but never really involved in the struggle for first with the other three. The rstage began in sizzling heat with local hero Chavanel of the Direct Energie team based in this Vendee Western France region being cheered all along the 155km of a solo break. Luis Leon Sanchez of Astana pulled out of the race after falling on a traffic island and getting up covered in cuts and climbing crying into the team car. Tsgabu Grmay of Ethiopia also retired. Monday’s third stage is a 35.5km team time-trial where the agenda for a tricky first week should be set with some significant time gaps expected on a slightly rolling course around Cholet in the same region as the first two stages. Email “Sagan sprints to victory as he savours 'special day' in front of family and friends”. Feedback on “Sagan sprints to victory as he savours 'special day' in front of family and friends”.